Home Blog A Busy Month For Exhibitions! November is often a busy month for exhibitions, and this year was no exception! The last 4 weeks have seen us designing, managing, delivering, installing, demounting and returning to storage 4 different exhibitions stands. We travelled the length and breadth of the country; including Glasgow, Birmingham, London and Nottingham. Phew! 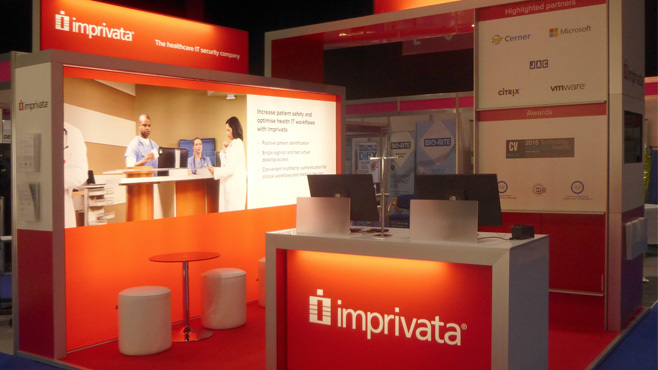 From an 8m x 4m structure which is open on all sides, to a 4m x 4m open on 3 sides, our modular solution for our longstanding client Imprivata has proved itself a worthy investment once again. By creating this modular solution we have been able to re-use structures, components and graphics where appropriate, therefore optimising the clients’ investment and staying on budget with a long-lasting solution. This stand uses an aluminium frame, which is easily adapted to the clients’ requirements. We use a combination of backlit fabric, rigid print graphics and coloured and clear perspex, there is also integrated storage, light boxes, display cabinets, large monitors, literature racks, shelving and lockable demo stations. Using this system, we are able to create bespoke solutions such as this at a fraction of the costs of traditional bespoke stands. In addition to the design and build of the stand, we provide a full turnkey service, including all organisation, electrical and data management and even flooring. This way we take care of the logistics and the client is free to concentrate on their event and generating new business. North of the border, central London and the Midlands…it’s all part of the service! Glasgow in the snow was the venue for Starkey’s 5m x 5m island site stand. All was going according to plan, until we had a very last minute call asking if it was possible to include a “Wireless Energy Bar” on the stand, 4 working days before packing…not a problem! The idea was to show off Starkey’s new wireless technology products, demonstrating their motto of “Hear Better Live Better”. In addition, they wanted to provide healthy refreshments to those viewing demos at the bar, tying in with the energy bar and healthier living theme…not a problem! Drinks located and ordered, fridges and additional electrics arranged, new graphics created, everything was approved and packed at breakneck speed and after all that, the event was a great success. We hope this gives you a small insight into how we work; we’ll move heaven and earth to make things happen for our clients and ensure they have a stress event…not a problem! At Williams&Crosby, we believe in providing a great creative solution coupled with exceptional commitment and service. This has been central to our success over the last 30 years and has played a large part in why we have retained clients for many years.